Even though I have done all of the housework this week with a broken wrist I was told today that I dont pull my weight with the chores. Sorted the cat out 🙂 left her a radio on and a lamp and shut her in the living room. Voila! No disturbed sleep. The mother of all cat poops was waiting for me on the morning. So all is good here. I keep getting electric shocks from Dusty’s ears and I got one from the end of her nose! Poor love bounded off in surprise from that one! I think I overdid the skyrim yesterday, my elbow is really cramped today…curses! I think I might use the slendertone while I’m not cycling / riding. I dont mind being heavier but it always deposits on the belly to start with and that’s not a good look! Having said that, it hasn’t made a tremendous difference to SO’s ahem, physique. About nelson Mandela, I guess I’m just a slave to the media slants because SO says Mandela is nothing but a terrorist and that he probably has less conviction than a certain prominent Muslim fundamentalist, or Irish terrorist organizations. I really can’t argue when I dont know all that much about it, but in my opinion, fighting against apartide is a more noble cause than just fighting for land or religious ideology. 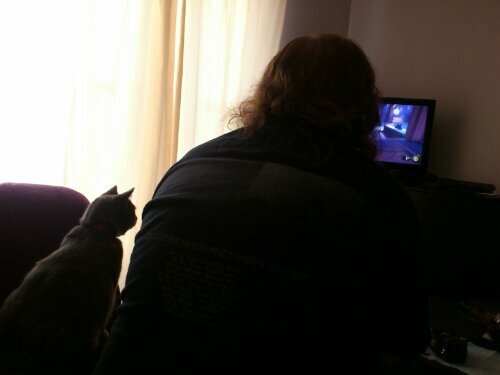 Cat enjoyed watching SO playing new bioshock. I think she prefers him to me. Largely because I’m annoying and want her to play all the time. Yup. Cats definitely dobt make good dogs. I started compiling this list of orders I have been given today but thought better than to publish it.I dislike statements beginning with ‘don’t…’ its just rude and disrespectful. But then so is giving threats then saying they aren’t threats but truth. Ok. Slight misjudgment here. Don’t slendertone soon after eating a heavy meal and chocolate…especially if nausea causes you health anxiety. I’m kind of looking forward to finishing the song of ice and fire books…I like them pretty well, but have read them back to back over several months ( difficult to fond time to read these days) and I’ve had perdido station sat in my living room for over a year now and I’d quite likes to read it. What to do over the easter holiday? Drink lots of tea, torment the kitty cat, continue to do all of the housework and feel sad that I can’t go see the ponies. Possibly the most pointless and boring post ever. My head hurts and seemingly the cure wasn’t to bleed out the spare words using a technological leech.